We’re just back from a long weekend in Cork, which I’ll be telling you all about shortly (though if you follow me on Instagram or Twitter you might have seen some snaps, and possibly even a room tour!). Like most people, I’m not exactly fond of packing - and it’s whittling down my beauty bits that I find the very hardest thing. Editing my makeup down to the things I’ll really need and use is certainly a challenge, but these days, at least I make an effort to be organised. Well, mostly. This time I did quite well; I made a list, brought a couple of multi-taskers and didn’t forget anything bar a powder. Some products I brought are current crushes, others are old, faithful friends, and a few bits and bobs I brought with me for trial and testing purposes. So enough jibber jabber - what did I actually take with me? FACE: The new Maybelline SuperStay Better Skin Foundation landed in my lap last week so I brought it along this weekend, with the matching concealer. It could have worked out badly as I didn’t have a backup but luckily I liked them both a lot, especially layered over the Isadora Under Cover Face Primer. EYES: Since I got my hands on the Urban Decay Naked Basics palette around this time last year it’s become an absolute essential in my kit. With five matte shadows and one satin, the shades are brilliant to work with and so versatile: I use it on my brows, as eyeliner and to create an everyday or softly smokey eye look. My Smashbox eye primer came with me too, along with my NARS felt tip pen liner – one of the best I’ve used – and Benefit’s They’re Real mascara. CHEEKS: I’m forcing myself to try and master contouring so MAC’s Harmony came with me along with my Bourjois Bronzing Base. For blush, the Bobbi Brown Pink Coral blush is a pretty shade that livens up the face. My teensy little sample size of Benefit’s Watt’s Up came too. LIPS: I’m so proud of myself, people – I brought just two lipsticks with me for a whole three days away! A sheer red from Paul & Joe’s new spring line, and a favourite YSL coral. You’ll be hearing more on both lippies very soon! TOOLS: I packed my brushes separately in a little zip up pouch: my new Wayne Goss contour brush, eye brushes from NIMA Brush, Bdellium Tools and Sephora; Real Techniques duo fibre contour brush for blush and for foundation, my NIMA stippling brush. 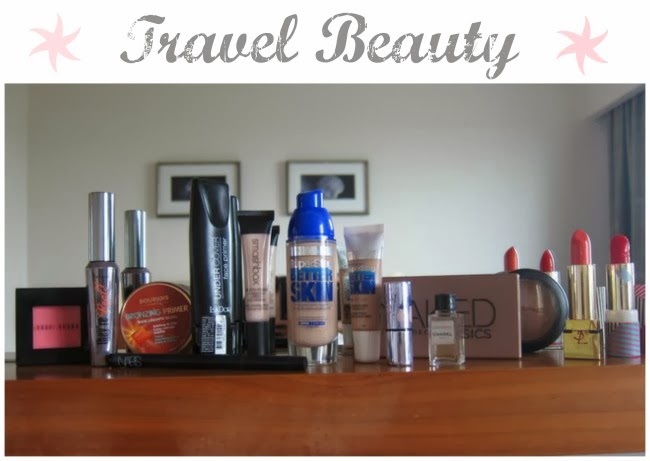 Do you have any tried and tested travel beauty favourites? What do you never leave the house without?Share ‘em in the comments! a wonderful post and great products! Oh wow that is an impressively restrained make up bag! I always think the hardest is if you're going abroad and can only bring carry on - I spend about a week depotting everything to smaller containers to make it fit into the 1 litre bag, and even then I'm asking my friends if they can fit some of my things into theirs! I love my naked basics palette too but have never used it on my eyebrows, which one do you use for yours? Looking forward to hearing more on the foundation. I picked up a set of minis from Benefit before Christmas, including the Watt's Up, which I am loving! Otherwise, I tend to bring the Nars palette I have with me everywhere now- 4 perfect eyeshadows and 2 blushes. Love it! I have a literal panic attack everytime I pack a make up bag for going away. I went away to liverpool for 3 days last year and genuinely couldn't understand how I could be expected NOT to bring 17 lipsticks. Can you help next time? I want that Wayne Goss brush!!! Thanks for sharing, Emma:) I've always loved this kind of beauty posts. For travel, the only thing I bring is my Garnier BB cream and a NARS blush/bronzer duo, plus mini brushes. The Naked Basics are essential. By the way, have you tried using naked 2 for contouring? I've had fairly good luck, and it saves some space, although that might also be the reason I've hit pan on that shade :p Come to think of it, I use it, along with the dark brown shade to fill in my brows as well. 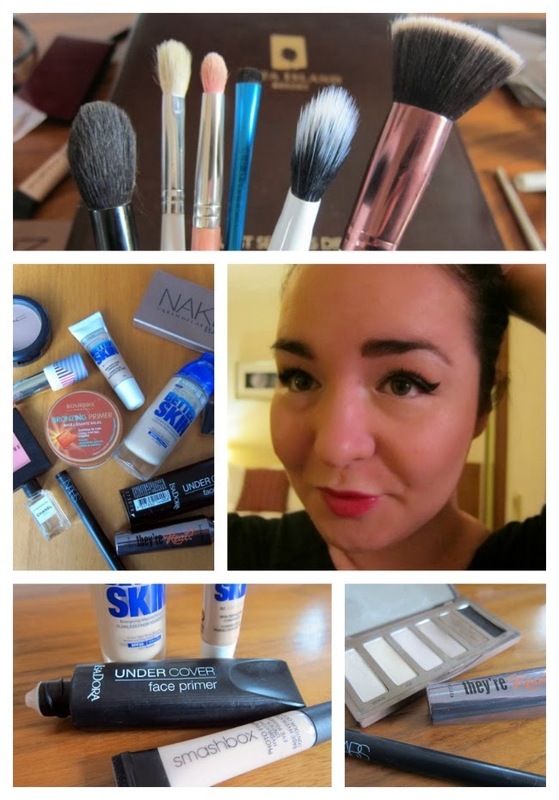 This post comes at the perfect time because I have to pack my beauty bag for a weekend wedding, thanks for the ideas! Happy End of the Week! Great job paring down Emma! I try to bring sample sizes when traveling as well. I can't imagine ever going without mascara or blush. Your makeup skills and knowledge always amazes me. I always love peeking into peoples makeup cases and travel bags. You are quite the expert. you are such a beautiful doll emma. that wing tipped eyeliner looks awesome on you. great products in your bag. i love the brands.